Top Down Crochet Sweater Free Pattern - Seamless Raglan! 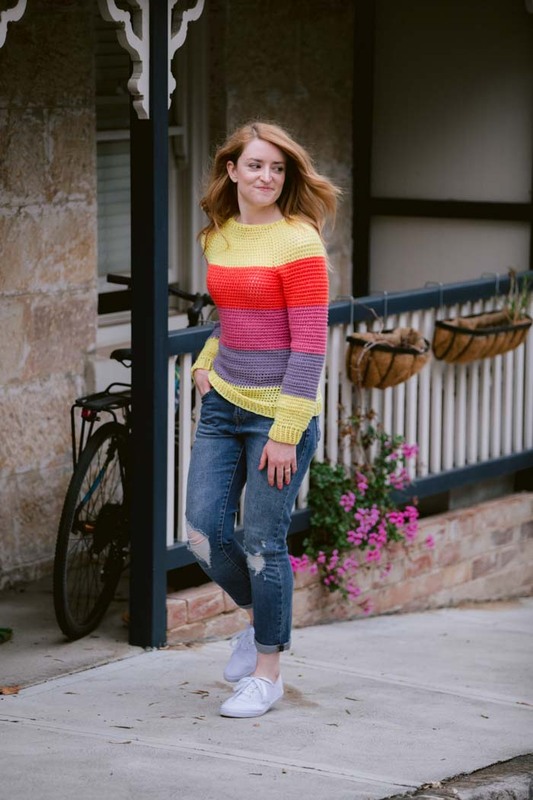 With a seamless construction and lightweight stitch pattern, this colorful top down crochet sweater is the perfect springtime layering piece to add to your handmade wardrobe. Find the full free pattern below or purchase the ad-free, printable PDF here! Thanks to Lion Brand Yarns for providing the yarn for this free top down crochet sweater pattern. This post contains affiliate links. Welcome back to the Make & Do Crew guest designer series. 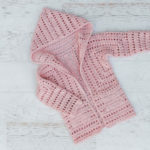 While I’m getting to know the newest baby in our family, Ashlee from Colourful Crochet is sharing her free top down crochet sweater pattern with us today! 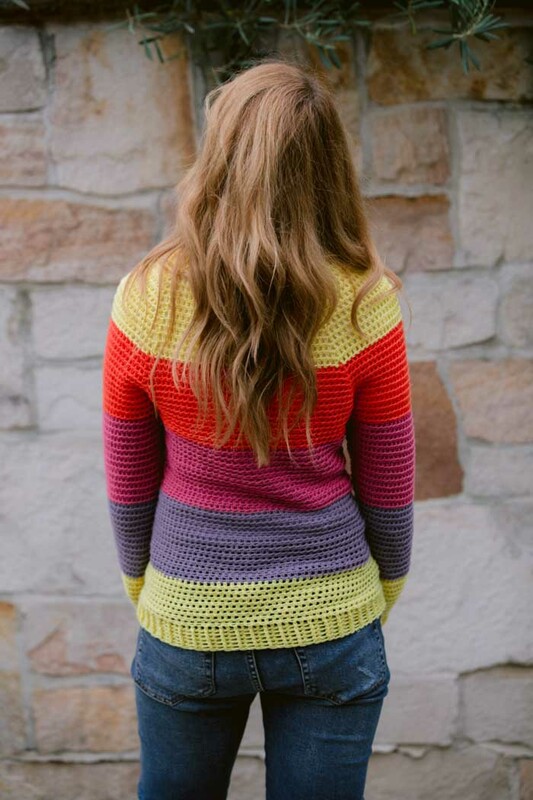 You can see lots of of Ashlee’s crochet patterns on her blog, Colourful Crochet, or on Ravelry. And be sure to check her out on social media too: Instagram and Pinterest. Ashlee, take it away! Hi everyone! 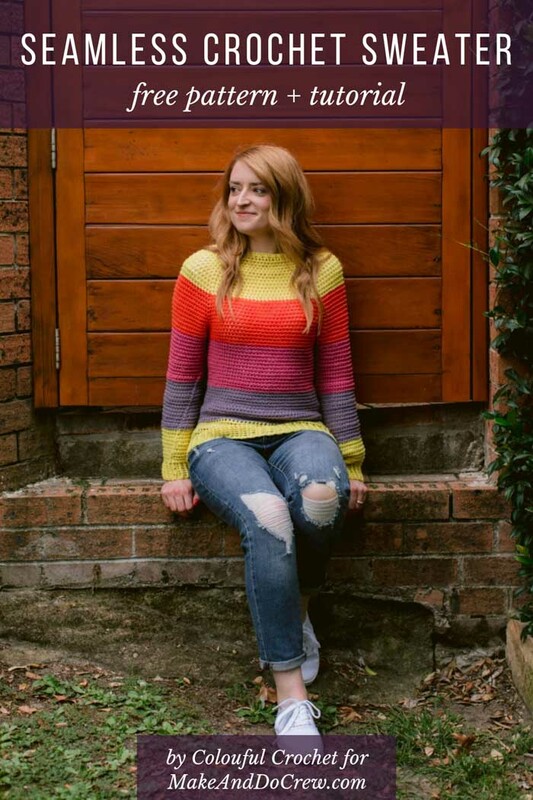 I’m Ash from Colourful Crochet and I’m so incredibly excited to share with you the Slice of Nice Sweater pattern. In case you didn’t guess from my name, I love working with bright colors! I can’t help myself, I’m just naturally attracted to bold color combos. The inspiration for this sweater came to me one day, on my way home from my daily commute. I spotted a girl in the train station and did a double take because she was wearing the most beautiful, bright rainbow sweater! Just catching a glimpse of that sweater made my mood 100% better. I wanted to make a simple, textured sweater that reminds you of when you were younger and you had a favorite sweater that cheered you up. It made you carefree, fearless and in the mood for fun. I don’t know about you, but I wouldn’t mind being more like that, more often. For me, this sweater is reminiscent of being a teen, eating ice-cream or popcorn, going to the movies with your friends & throwing on a sweater to stop that theater chill. As an adult, running out for a coffee first thing in the morning, feeling comfortable and practical, too lazy to coordinate an outfit but knowing you look darn good. I designed this sweater for the patient beginner. Don’t let the stitch breakdown overwhelm you; you are going to use one main stitch for the entire piece (Extended Half Double Crochet) and then slight variations of this stitch throughout. This sweater is going to teach you how to work a top down crochet sweater in the round. There is no seaming or tricky assembly, so it’s a perfect repetitive pattern for when you want to do some simple textured crochet. Once you get the hang of the first couple of rows, you will be all set! Anyone above beginner should breeze through this pattern without much trouble. 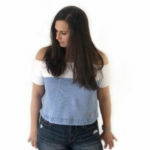 You may not need them, but I also have a great video to help you with the trickiest part of the pattern – Row 27: creating the sleeves. For this project, I chose Lion Brand’s Superwash Merino because it comes in 26 vibrant colors! (See them all here.) Be still my color loving heart! Whether you love brights (like me) or neutrals, you’ll have endless color combos to choose from. Check out the #sliceofnicesweater tag on Instagram if you need inspiration. Another great feature of this Lion Brand Superwash Merino is that it has amazing yardage! One skein equals 306 yards, which is really good value in my humble opinion. But what I love most about this yarn it that it’s beautiful and so, so soft! It has a squishy, stretchy texture, which makes it perfect for a lightweight spring sweater that you can just throw on over a t-shirt or a tank top. Pair it with a skirt or ripped cutoffs and you’ve got yourself an instantly cute outfit. This yarn also has quite a lot of stretch, so if you must substitute choose a stretcher yarn in the same weight otherwise your sweater might come out quite stiff. Looking for more crochet garment patterns with super easy construction? 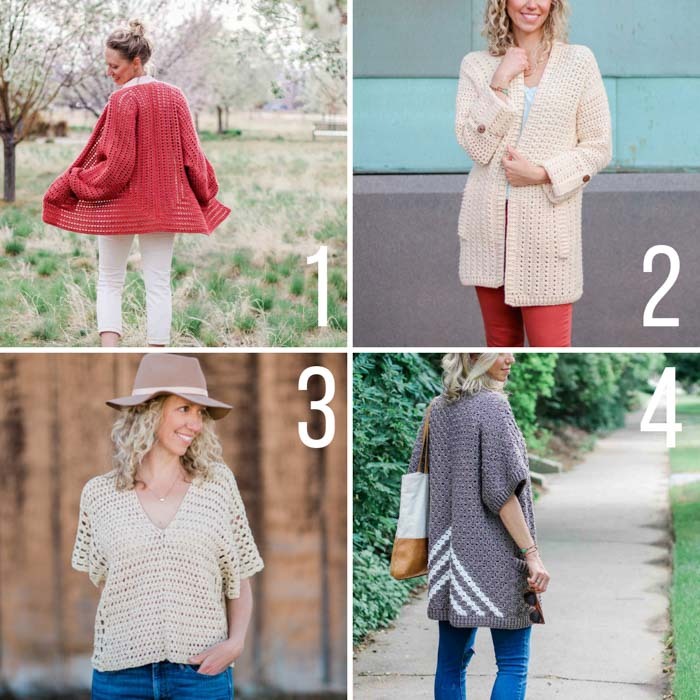 Check out some of these free crochet patterns made from simple shapes! The Slice of Nice Sweater is designed to be a fitted, lightweight sweater. It is perfect to throw on when you need a light layer of warmth. 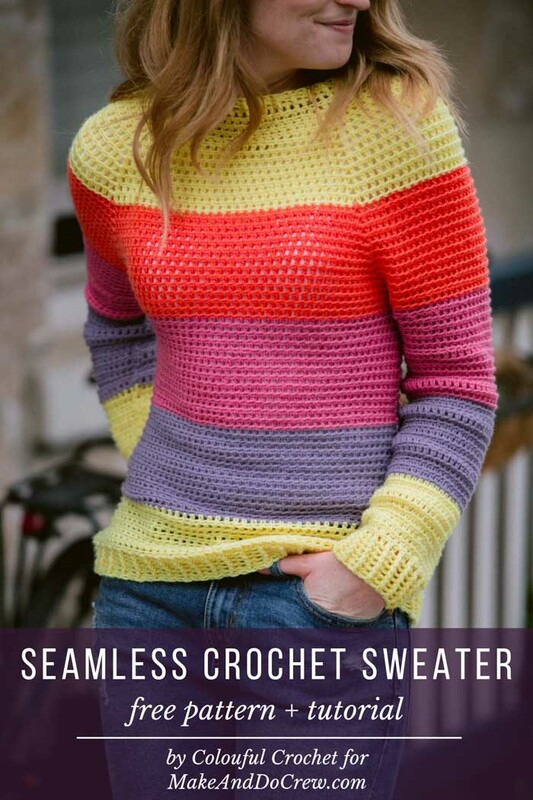 Super comfy and soft, this bright and colorful sweater will put a smile on your face, whether you’re out and about or just lounging at home. If you need to substitute with another yarn make sure it is a yarn with good stretch! If your yarn is stiff, I recommend sizing up so you have more positive ease. EHDC: Extended Half Double Crochet – Yarn over, insert hook into stitch, yarn over and pull up a loop (3 loops on hook). Yarn over and pull through the first loop on hook (3 loops on hook). Yarn over and pull through all loops. v stitch: EHDC, ch1, EHDC in same st- These will be our increase stitches. V stitches are worked in the chain space gap created by the V stitch of the previous row. EHDC2TOG: Extended Half Double Crochet 2 Together – Yarn over, insert hook into stitch, yarn over and pull up a loop (3 loops on hook) Yarn over, pull through 1st loop on hook. Yarn over, insert hook into next stitch and pull up a loop (5 loops on hook) Yarn over, pull through 1st loop (4 loops on hook) Yarn over, pull through all loops. SEHDC: Standing Extended Half Double Crochet – Slipknot on hook, yarn over, insert hook into stitch, pull up a loop (3 loops on hook), yarn over pull through first loop, yarn over pull through all three loops. FPEHDC: Front Post Extended Half Double Crochet – EHDC around the post of the stitch from the row below. BPEHDC: Back Post Extended Half Double Crochet EHDC behind the post of the stitch from the row below. FPSC: Front Post Single Crochet – Single crochet around the post of the stitch below. BPSC: Back Post Single Crochet – Single crochet behind the post of the stitch from the row below. • This sweater is worked from the top down, starting with the neckline. It is worked in rounds down the body, like a square with equal sides. To make the sleeves, you will attach your yarn and work in the round from the shoulder down, and then finish with a ribbed cuff. • To finish off the sweater, you will join at the neck to create a fitted neck ribbing. • This pattern is written with equal blocks of color, but you can change colors to create smaller or larger color blocks by adjusting the row count. • Ch 3 at the beginning of each row counts as a EHDC stitch. • All EHDC are worked into the back loops of the stitch, the front loop creates the ridgeline. • When changing colors- work first half of your EHDC stitch- YO, insert hook into stitch, YO and pull up a loop (3 loops on hook). YO and pull through the first loop on hook (3 loops on hook). YO with the new color and pull through all loops. • As the pattern is worked in the round, you will have a slight seam line on the side running down the body and sleeves. Once worn the seam lines will straighten out. • Do not be worried if your seam line looks a little wonky while working in the round! • Neck Ribbing: The neckline of this sweater is designed to fit snuggly around your neck. It can be tight to get off, but if you use Lion Brand Superwash Merino, it has a lot of stretch. You want to be able to get it over your head but the yarn to bounce back into place so it will be flush with your neckline. Join in the round by sl st in top of 1st st without twisting ch. This row joins V stitches together to create armholes. I have a video tutorial of joining the armholes available on my website here. 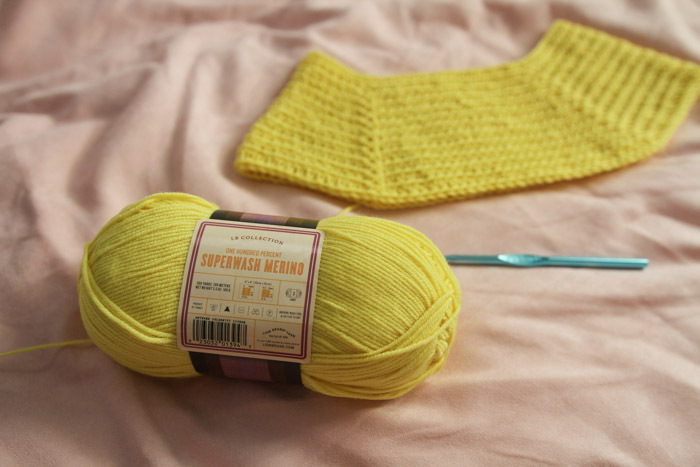 • YO, insert your hook into the V stitch and the next V stitch (front to back- skipping all sts in between) YO, pull through both sts (3 loops on hook) complete your EHDC st.
You will now work in the round to create the body of the sweater- skipping the armholes you’ve just created. Sew in ends from color changes. Repeat Sleeve Rows 1-40 for second sleeve. Sew in ends and you’re finished! Don’t forget to share your Slice of Nice sweater online! 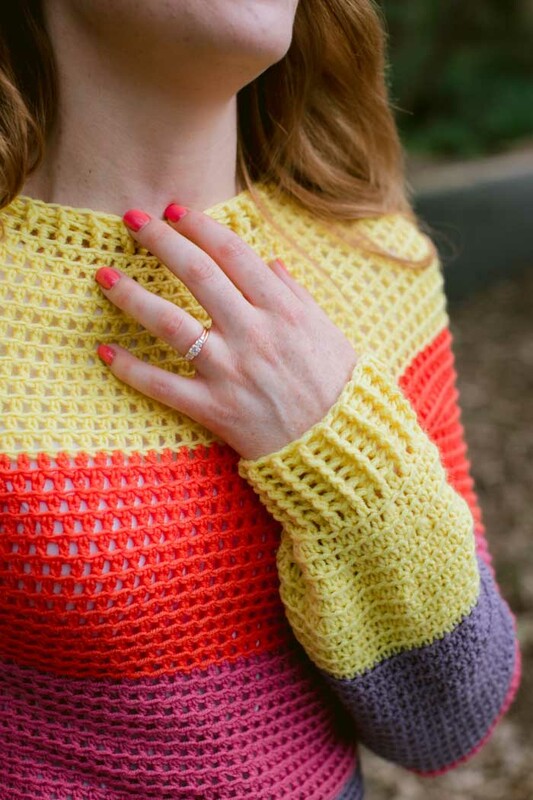 Use hashtag #sliceofnicesweater and tag me @colourful.crochet on Instagram to be featured! 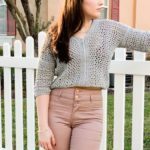 Thanks again to Ashlee of ColourfulCrochet.com for sharing this free seamless crochet sweater pattern! 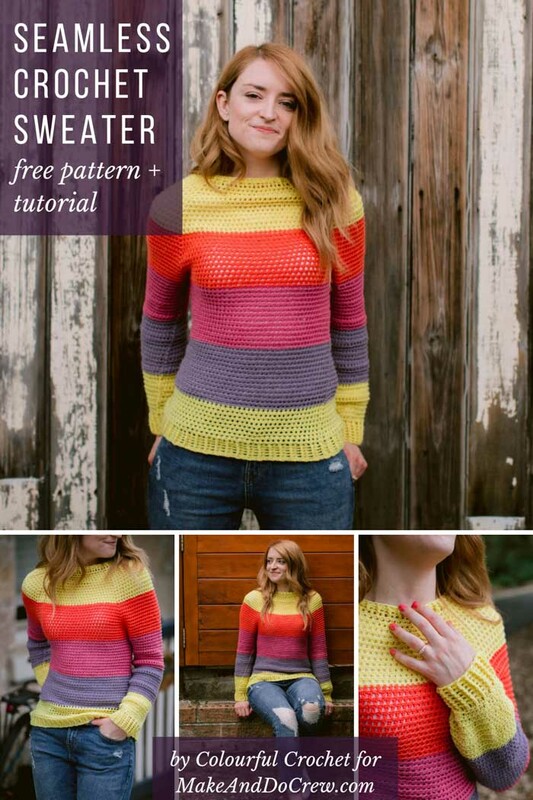 Be sure to check out Ashlee’s blog for lots more free modern crochet patterns! 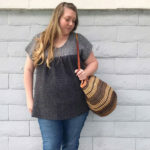 If you love this top down crochet sweater, you might also like to check out these free crochet garment patterns that are perfect for warm weather. You can always find all our free patterns for spring here. 2. 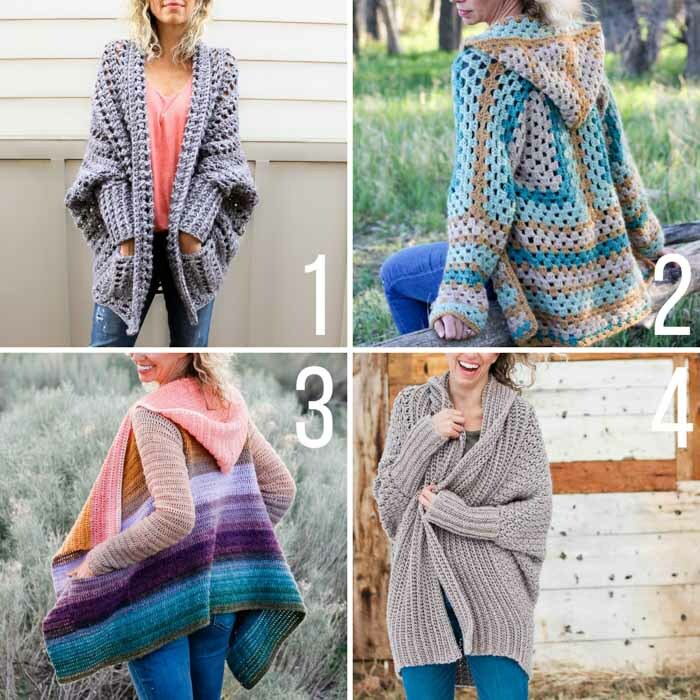 Alchemy Cardigan + video tutorial – Last year’s popular crochet along is still inspiring makers to whip up this lightweight, four-season cardigan. The very detailed video tutorial will guide you every step of the way. 3. Saratoga Poncho Top – Made from two simple rectangles, this stylish top will take you effortlessly from music festival to BBQ to beach vacay this summer.​ Featuring flowing lace and very simple construction.